72 days. Solanum lycopersicum. 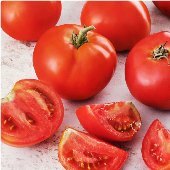 (F1) Early maturing plant produces high yields of 10 to 14 oz red beefsteak tomatoes. They are very sweet, juicy, and flavorful. Perfect for salads, sandwiches, and gourmet dishes. Crack resistant. Excellent choice for home gardens. Disease Resistant: V, F, A. Indeterminate. 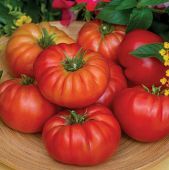 Tomato plants should be grown in a warm areas and receive plenty of sunlight, so choose a sunny spot in your garden. Relocate your tomato plants in different parts of your garden each year to avoid diseases. Optimum temperatures for growing tomatoes are between 65 and 85 degrees F. Plant your seeds indoors 10 to 12 weeks before setting outside. Use Miracle Gro Seed Starting Material for best germination results. We have tested other Seed Starting Mix and experienced poor germination rates. You may have to special order the Miracle Gro Seed Starting Potting Mix from your nursery, as it is hard to find it at many of the large home and garden centers. Do not add any soil, fertilizers, and other chemicals to seed starting material! Do not use jiffy peat pots, plugs, or potting soil as the soil becomes too dry or too wet, which can lead to disease and fungus. We have experienced disease and low germination when using these types of products. When seedlings are 4" tall, transplant them in larger pots. Plants should be at least 10" tall before transplanting outdoors. Place plants outdoors in shady area several days before transplanting outdoors. Shelter the transplants to prevent sunburn, wilting, and rain damage. Spring planting should occur when soil is warm, at least 3 weeks after last frost, and when temperatures remain above 70 degrees F. You can plant early if you use water towers. To prevent branches from breaking from the weight of tomatoes, use 5 to 6 ft tall cages. To tie plants to stakes, use soft strips of cloth. Check indeterminate plants regularly, and pinch off suckers and side branches where leaves join the stems. Plants can grow 1 to 6 ft tall. Requires fertile slightly acid soil in a well drained location in the garden. Apply mulch and grass clippings, or straw around base of plant. Work the soil thoroughly before planting. Add well-rotted manure and compost. Keep soil consistently moist, but not waterlogged. Water well during dry and hot spells. Water in the morning only, on the side of the plants and not directly on the leaves. 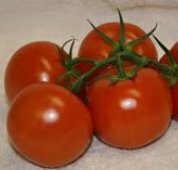 Harvest tomatoes when they are fully mature using a garden scissor so you don't damage the plant. Pick them as they mature to encourage new fruit to form. Remove any decayed tomatoes from the plant. Anthracnose is a world-wide fungal disease that affects the growth of cucumbers, tomatoes, and watermelons. This disease is most common in the southern, mid-Atlantic, and mid-Western parts of the United States. Symptoms include lesions on the leaves and then yellowish circular spots begin appearing on the leaves. On watermelons the spots are irregular and turn dark brown or black. The most striking symptom is circular, black, sunken cankers appear on the fruit. When moisture is present, the black center of the lesion is covered with a gelatinous mass of salmon colored spores. With tomatoes, the disease mainly affects the tomato, but also can infect leaves, stems and roots. Sunken water soaked circular spots appear on the tomatoes. Leaves show symptoms of small circular spots with yellow halos. It can cause significant yield loss and even total crops losses. The diseased tomatoes are usually unmarketable. The infected plants should be removed to avoid further infestation. Increase space between the plants to maximize air flow and drying of the leaves. The disease is favorable when temperatures are 75-82 F and usually occur when moisture and humidity are very high. Plan on using a 3 year crop rotation and avoid planting in the same location, year after year, as the disease can survive in over winter on crop debris. Proper tillage practices may be helpful in managing the disease. Fungicides can help manage the disease. The best option is to use disease resistant varieties. Fusarium Wilt, Race 1, is a fungal disease that affects the growth of tomatoes. It is one of the most devastating of all soil-borne diseases. Race 1 is the most widely found throughout the United States, especially in warm regions of the country. It attacks the roots of the plants and moves up the stems. Symptoms include yellowing and browning of the older bottom leaves, stunting, and wilting. Often the entire plant will die. Usually little or no fruit develops. The infected plants will produce inferior and unmarketable tomatoes. It can cause significant yield loss and even total crops losses. If you stick with Fusarium Wilt Resistant tomato varieties you don’t have to worry. Many of the older heirlooms don’t have any resistance to the disease, so if you grow these then you should keep an eye out for it. The infected plants should be removed and burned to avoid further infestation. Plan on using a 5 to 7 year crop rotation and avoid planting in the same location, year after year, as the disease can survive in the soil up to 10 years. 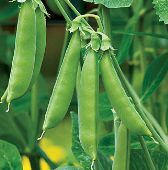 The best option is to use disease resistant varieties.